The artists of Springkeeper are new storytellers, treading the edge of chaos to glimpse the landscape of the future, and weaving the patterns of the new into strong ropes of song and story. Leading the way like a latter-day Pied Piper is flutist Victoria Beatty. Beatty earned a master's degree in English from the University of Missouri at Columbia, where she also studied flute with Steven Geibel. She continued her flute studies with Karl Kraber at the University of Texas at Austin, and attended masterclasses with James Galway, Donald Peck, and Carol Wincenc. As a member of the flute/ guitar duo, Aeolus, she and partner Jerry Dadap, Jr., recorded a Christmas album, Joyance, in 1989. Beatty is also an accomplished visual artist, and her works have appeared in juried shows and one-woman exhibitions. 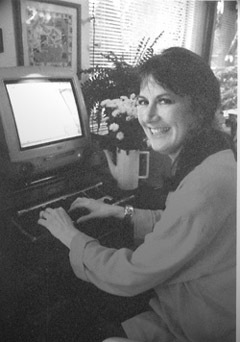 She has created award-winning websites, most notably The Garden of Origami (1998-2000). In 2003, she earned a master's degree in Library and Information Science from the Information School at the University of Washington. She is now the Instruction/Distance Services Librarian at Diné College, the Navajo tribal college, in Tsaile, Arizona. The story of Springkeeper began with an unusual woodwind quintet, two composers, and Halloween. As an educator, Beatty found herself developing programs for the ensemble's annual Halloween concerts. By focusing on mythic archetypes, the programs offered a larger context for holiday traditions. Her colleagues in the quintet were highly creative, and they enthusiastically embraced more theatrical productions incorporating costumes and other visual art. All of them had a deep appreciation for the music of language, and they began to find ways to incorporate spoken word in their musical performances. The woodwind quintet instrumentation began to seem too confining, and composer friends created music for more adventurous combinations. As she sought the integration of verbal and nonverbal, Beatty explored an underlying deep ecology of myth and storytelling, rooted in a wellspring where the arts are whole, spontaneous, and undifferentiated. The result was Springkeeper, an alliance of musicians, visual artists, dancers, and storytellers exploring universal themes. Like the Maidens of the Wells in Celtic mythology, or the Springkeepers of ancient Australian tradition, Springkeeper guards these living waters and serves as a conduit for bringing their fresh wisdom into the world.